The goal is not to make a better computer than conventional ones, said project collaborator Klaus-Peter Zauner of the University of Southampton, but rather to be able to compute in new environments. "The type of wet information technology we are working towards will not find its near-term application in running business software," Dr Zauner told BBC News. "But it will open up application domains where current IT does not offer any solutions - controlling molecular robots, fine-grained control of chemical assembly, and intelligent drugs that process the chemical signals of the human body and act according to the local biochemical state of the cell." The group's approach hinges on two critical ideas. 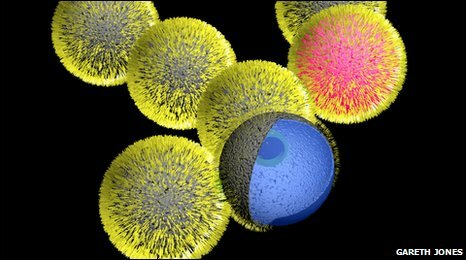 First, individual "cells" are surrounded by a wall made up of so-called lipids that spontaneously encapsulate the liquid innards of the cell. Recent work has shown that when two such lipid layers encounter each other as the cells come into contact, a protein can form a passage between them, allowing chemical signalling molecules to pass. Second, the cells' interiors will play host to what is known as a Belousov-Zhabotinsky or B-Z chemical reaction. Simply put, reactions of this type can be initiated by changing the concentration of the element bromine by a certain threshold amount. The reactions are unusual for a number of reasons. But for the computing application, what is important is that after the arrival of a chemical signal to start it, the cell enters a "refractory period" during which further chemical signals do not influence the reaction. That keeps a signal from propagating unchecked through any connected cells. Such self-contained systems that react under their own chemical power to a stimulus above a threshold have an analogue in nature: neurons. 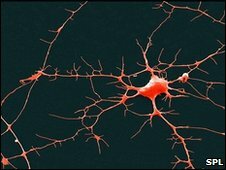 "Every neuron is like a molecular computer; ours is a very crude abstraction of what neurons do," said Dr Zauner. "But the essence of neurons is the capability to get 'excited'; it can re-form an input signal and has its own energy supply so it can fire out a new signal." This propagation of a chemical signal - along with the "refractory period" that keeps it contained within a given cell - means the cells can form networks that function like the brain. Frantisek Stepanek, a chemical computing researcher at the Institute of Chemical Technology Prague in the Czech Republic, said the pairing of the two ideas was promising. "If one day we want to construct computers of similar power and complexity to the human brain, my bet would be on some form of chemical or molecular computing," he told BBC News. "I think this project stands a real chance of bringing chemical computing from the concept stage to a practical demonstration of a functional prototype." For its part, the team is already hard at work proving the idea will work. "Officially the project doesn't start until the first of February," said Dr Zauner, "but we were so curious about it we already sent some lipids to our collaborators in Poland - they've already shown the lipid layers are stable."